So the weather has turned extremely chilly of late, prompting the need for some warm winter knitwear. Nothing like cold icy winds to put the pressure on when you're being slack in finishing up an item. Therefore, I present one quick fix for cold icy weather. 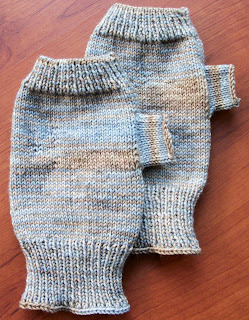 These gloves were actually quite a quick knit, and were well received by my five year old niece, who immediately put them on and didn't take them off all weekend! I picked the yarn up at the Bendigo Wool and Sheep show last year and I live the stitch definition. I made sure to pick up some more of this again this year. Next up we have a Noro striped scarf that I knitted up for Mum. I made one of these for myself last year and had to go to great lengths to keep my mother stealing it on me! I originally started this with the intent of giving it to Mum for Mother's Day, but it was nowhere near finished at the time. However I did finally get this finished recently, when we had our coldest day in two years. Needless to say it was another gift that was definitely appreciated. 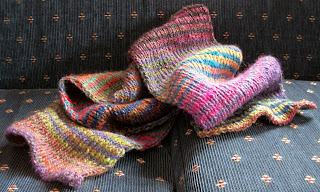 Modifications: Knitted this using 49 stitches rather than the 39 stitches the pattern calls for, as Mum requested hers to be an inch wider than mine, as she likes wider scarves. I purchased this yarn at Easter last year while on holiday at Daylesford, so this counts as using up souvenir yarn as well as knitting from stash. 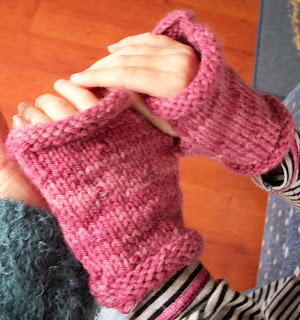 Then we have another pair of fingerless gloves, also made for Mum. An attempt to use up some of my steadily growing stash of Sanguine Gryphon Bugga, while knitting something nice for my mother to wear while at work. I love knitting with this yarn, it's so soft and warm and squishy - I'd stop my knitting almost every five minutes just to admire the yarn! 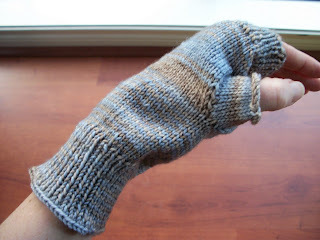 Eventually though these were done, and the super high cashmere content of this yarn has ensured that they have been steadily worn since they were gifted. Last up, we have a little finished object I knitted for me. I actually started this last year, but decided I needed a nice bright scarf to go with my new winter coat, for my annual pilgrimage to the Bendigo Wool and Sheep show, so this came out of the UFO pile to be completed. So to wrap up, lots of finished objects to show you this time. It's amazing what a motivation a bit of cold weather can be!